A car bomb planted in central London would have caused "carnage" if it had exploded, police say. A controlled explosion was carried out on the car, packed with 60 litres of petrol, gas cylinders and nails, in Haymarket, near Piccadilly Circus. An ambulance crew saw smoke coming from the green Mercedes, near the Tiger Tiger nightclub at 0130 BST (0030 GMT). 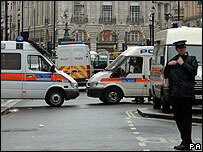 London's Park Lane was later cordoned off while a suspicious vehicle was investigated. Scotland Yard, Assistant Commissioner Tarique Ghaffur urged people to be "alert and vigilant" and to report any suspicions to the police. Disruption would be kept to a minimum, he said, although the police were reviewing the safety of a number of big public events set to take place in the capital over the weekend. Earlier, a Scotland Yard spokeswoman said that Park Lane was closed at Marble Arch to Hyde Park Corner and a 200m cordon was in place. Sources close to the investigation said the Park Lane closure was linked to the discovery of a vehicle at an underground car park. A police robot was being used to investigate the vehicle. "International elements" were believed to be involved with the Haymarket bomb, Whitehall sources told the BBC. Deputy Assistant Commissioner Peter Clarke, head of Scotland Yard's counter-terrorism command, said: "It is obvious that if the device had detonated there could have been serious injury or loss of life." The ambulance had been called to the nightclub - where up to 1,700 people were inside - when they spotted smoke, now believed to be vapour, inside the car. Bomb experts manually disabled the "potentially viable explosive device". Scotland Yard declined to comment on reports that a mobile phone was found in the Mercedes that may have been intended to trigger the explosion. One report claimed that a quick-thinking officer disconnected the mobile phone before bomb squad officers arrived. Mobile phones have been used to detonate bombs in Iraq and Indonesia and in other terror attacks, such as the 2004 Madrid bombings. The car bomb has echoes of other terrorist plots. Five men were jailed for life in April for a UK bomb plot linked to al-Qaeda that targeted a shopping centre and a nightclub with a giant fertiliser bomb. DAC Clarke told a press conference that it was too early to say who was responsible but the incident "resonated" with previous terrorist plots. "The threat from terrorism is real. It is here, enduring. Life must go on but we must all stay alert," he said. Mr Clarke also specifically mentioned nightclubs as a potential target. Following Friday's discovery police patrols in central London were stepped up "to provide a visible reassurance", rather than in response to a specific threat. Officers will visit licensed premises to reiterate ongoing crime prevention and safety advice, said a police spokesman. The Muslim Council of Britain, the largest organisation representing Muslim groups in the UK, urged people to help the police find the perpetrators. Secretary-General Dr Muhammad Abdul Bari, said: "It is now a duty upon all the rest of us to help the police so that they can bring whoever was involved in this plot swiftly to justice". Speaking in Downing Street after a private meeting with Prime Minister Gordon Brown and the new Home Office minister for security, Admiral Sir Alan West, Home Secretary Jacqui Smith urged members of the public to report anything suspicious to the police. Mr Brown said Britain faced "a serious and continuous threat". He added the public "need to be alert" at all times. The BBC's Andy Tighe said the timing was significant coming a day after Mr Brown became prime minister, and with the second anniversary of the 7 July bombings approaching. Earlier reports said bouncers from a nearby nightclub saw the car being driven erratically before it crashed into a bin. They claimed the driver then got out and ran off. A police source said the bomb was a "big device" and had posed a real and substantial threat to the hundreds of revellers leaving the area's bars and nightclubs. Dozens of forensic officers examined the scene and the car was taken to the Forensics Explosives Laboratory in Kent for further tests. The current terrorism threat level has been classed as severe - one level lower than the highest "critical" - since 14 August 2006. Intelligence sources said they were keeping an open mind on who was responsible for the car bomb. The BBC's security correspondent Frank Gardner said the incident had "come from nowhere" and that the driver of the car was now Britain's "most wanted". He said CCTV was the key to finding the "first clue" as to who was behind the attempted bombing.